Snapper "spring and Summer" Snook Pompano "All Year"
Cobia "Spring and Fall" Permit "Winter (Full Moons)" Blue Runners "All Year"
Bonita "Late Spring and Summer Croakers Mackeral "All year"
Juno Fishing Pieris 990-foot pier. This pier is sand all the way out and is best when you have N to Ne wind and S to Se. Snapper at certain times of the year are found underneath. 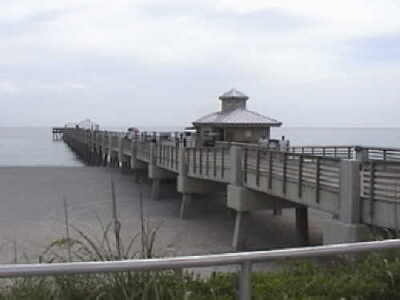 The first 1/3 of the pier is good for Croakers, Snook , Flounder, Red fish. The second third of this pier you will find Pompano, Permit, Macks, Bluefish. End of the pier, last third Macks, Bonita, Big Crevalles, Snook, Bluefish, Sharks, Permit, Cobia, Kingfish.